SCBA President Dave launches no-holds barred attack on the Collegium system; says "what happened in the past 22 years under the collegium difficult to digest"
Supreme Court Bar Association (SCBA) president and senior counsel Dushyant Dave tore into the collegium system saying "what had happened in the past 22 years under the collegium was difficult to digest" and there was "so much of frustration and disappointment". The collegium system was introduced by the apex court pursuant to its verdict in what has come to be known in popular parlance as the ‘second judges case’ in 1993. "Some of the finest judges were denied (elevation to apex court) and elevation of some of the finest judges was delayed, merely because someone in the collegium did not like them," Dave told the apex court adding that it had become a "give-and-take" exercise. “Be it the 1984 anti-Sikh riots or the 2002 Gujarat riots, none of these cases have rendered justice, and if you were to see how wrong appointments have been made, you would know the reason. It is a shame how every court is going an extra mile to protect politicians and film stars, and ordinary citizens are deprived of justice,” said Dave. When the bench asked why the executive did not object to it, Dave said, "Executive wants pliable judges. They want weak judges. They (government) know how to manipulate" such judges for their selfish ends. Justice Khehar reminded that there were thousands of judges who were working hard day in and day out to make the system work and what the senior counsel was pointing to was the conduct of a few. As Dave went hammer and tongs on assailing the collegium system, Justice Khehar said, "We are not making any comparative evaluation of NJAC vis-a-vis the collegium system but "testing the NJAC validity on the touchstone of its constitutionality". 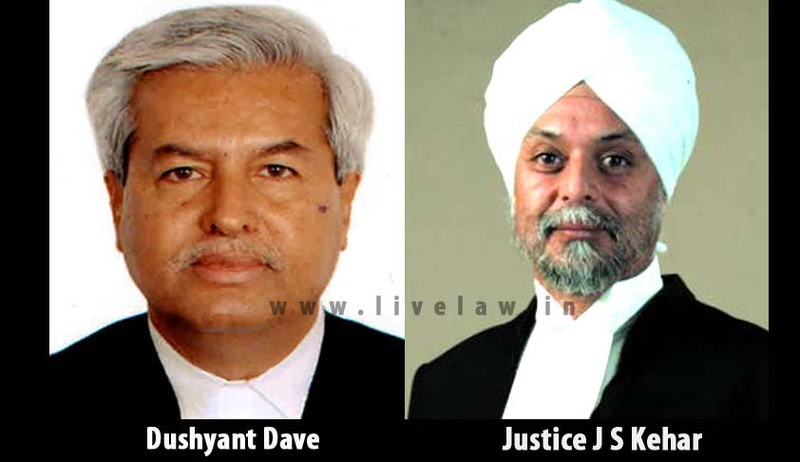 Justice Khehar asked Dave to give suggestions as to how to remedy the situation. In his no-hold-barred attack on the collegium system, Dave regretted that the apex court had failed to protect the "human rights and human values" of the common man. Describing it as a "shame and disgrace", Dave said that "every court goes an extra mile in protecting the people's human rights and values". He said that everyone accused in encounter cases in Gujarat was being let off but social activist Teesta Setalvad was running from pillar to post for her bail. On the other hand, Dave said, former Gujarat minister Maya Kodnani -- sentenced for her role in the Naroda Patiya massacre during the 2002 Gujarat riots to 28 years in jail -- was granted bail. In a related development in the NJAC case, the Supreme Court Advocate on Record Association (SCAORA) on Wednesday questioned in the apex court the central government's claim that junking the collegium system for National Judicial Appointment Commission was "the will of the nation". Assailing the government's contention that the "nation wants it (NJAC)", "people want it", SCAORA wondered which nation the Narendra Modi government was referring to: the nation of haves -- whose numbers are fast increasing - or the nation of have-nots -- whose condition, hopes and expectations have not markedly improved over the decades. "I would suggest that no one may speak (or claim to speak) on behalf of the nation as the nation is never before the court," senior counsel Fali Nariman told the apex court constitution bench comprising Justices Jagdish Singh Khehar, J. Chelameswar, Madan B. Lokur, Kurian Joseph and Adarsh Kumar Goel in his rejoinder arguments on behalf of SCAORA. To buttress his position, Nariman referred to an earlier judgment of the apex court which said "no one may speak for parliament as parliament is never before the court". Contending that the primacy of the judiciary as a concept that was an "anathema" to the elected representatives both in parliament and state legislatures, Nariman referred to several amendments to the Constitution to neutralise Supreme Court verdicts. Taking advantage of the vulnerability of the collegium system for appointment of judges to higher judiciary on account of its "lack of transparency", Nariman said, NJAC had been brought forth, which however "totally erodes and greatly damages the independence of judiciary". Advocating transparency in the selection of judges to the extent of maintaining a record of the criteria and exercises that underwent in the selection process, including recording the minutes, Nariman cautioned that exposing the system to public scrutiny through Right to Information Act would have its pitfalls. Describing it as "a bit alarming", the SCAORA cousel said exposing the "confabulations and consultations" to public scrutiny would subject the appointment process to public, political and media pressures.